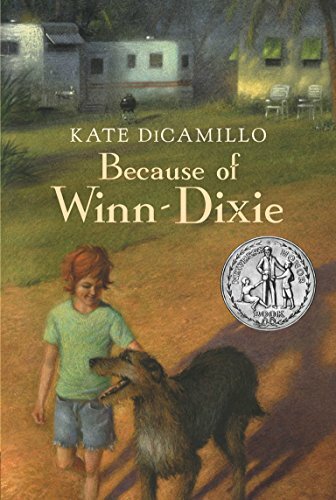 I recently did a reread (by audiobook) of Because of Winn-Dixie by Kate DiCamillo–and realized I’d forgotten pretty much all of the book–and remembered anew why I get so annoyed by the notion that kids books can’t deal with complex themes and ideas. Because of Winn-Dixie is about India Opal, ten years old and newly moved to Naomi, Florida. When she meets a stray dog in the produce section of a Winn-Dixie supermarket, she promptly dubs him Winn-Dixie and brings him home. Winn-Dixie proves to the most charming and friendly of dogs, who helps Opal find new, somewhat unconventional friends. This was a lovely book that is both a sweet and funny story about a childhood summer, and a deep and complex story about friendship, loss and the secrets everyone carries. Opal is a delightful narrator, believable as both childlike and insightful. Her loss is her mother, who left Opal and her father when Opal was only three. There aren’t many details, but alcohol was involved. The brilliance of the book is its balance–depicting a very adult issue in a child-appropriate way, and being true to the tragedy of the story without becoming a tragic story. Opal and Winn-Dixie make friends all over Naomi: Otis, the man who works at the pet store and makes beautiful music; Miss Franny, the sweet and fragile librarian; Gloria Dump, with her overgrown garden and tree of regrets; and Sweetie-Pie, five years old and desperately wanting her own dog. I love that Opal makes friends with people who aren’t obvious choices, who all prove to have more complex stories than they might at first appear. There are a few characters Opal’s age she becomes friendly with too, but frankly I found them less compelling. That leads right into my one issue with the book. I loved the unconventional, unexpected people who became Opal’s friends, and the message about not making immediate judgments–but I didn’t like how these otherwise lovely adults handled the two boys who were being nasty to Opal. Stevie and Dunlap, brothers aged 9 and 10, follow Opal on her bike, whispering (presumably rude things) and say rude things when she engages them. Gloria and Opal’s father both insist that really the boys just want to be friends, and Opal must apologize for her own rude comments and invite them to a party. The other characters are improbable friends because of who they appear to be. Stevie and Dunlap are improbable friends because of what they did, and that’s a world of difference. Frankly the whole thing sets off my alarm bells about victim-blaming, bullying, and cultural conventions that always demand the girl be polite and forgiving and make allowances for mean boys. Nowhere did I see any adult tell the boys to make any effort to curb their rudeness or be polite, forgiving or friendly towards Opal. Ultimately I think the book is about loneliness–which would be so sad, except that it’s also about lonely people finding each other and forming a new family. And with all that, it’s also a light, funny, fun story about a childhood summer–and it’s completely a kids book too! Good point about the boys. When was this book published? I’ll bet it was when bullying and harassment were not as prominent in the public consciousness as they are now. Funny how society’s standards change and what was not seen as an issue in the past is now viewed as something discordant in the book (and rightly so). I think it was in the last ten or fifteen years–but that still may be enough for the consciousness of bullying to have changed!